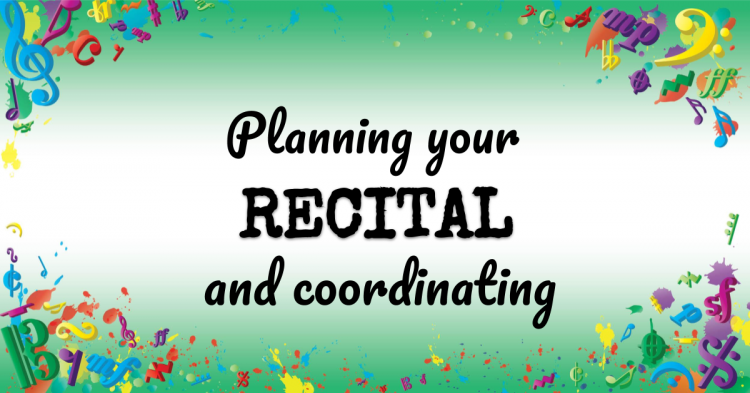 There’s so much to do when prepping for a recital. What are the essentials that need to go on your checklist? And when does each thing need to be done?! I’ll talk you through it all in this episode. Vibrant vibrant vibrant music teaching proven and practical tips strategies and ideas for music teachers. There is so much going on when you’re putting together a recital or a student concert and whether it’s your first one or you’ve done it 30 times before. I feel like it still is quite overwhelming for many teachers especially if it is your first one. I want to encourage you to keep it simple. In this podcast episode I’m going to go through the basics of setting up your recital. It’s still a lot of different steps so if you’re just getting going in your studio I want to encourage you just to stick with these in the next episode. I will go into all the different things you can do to make your recital more exciting like themes and all that fun stuff but you need the basics first you need things running smoothly and you need to deal with being stressed. 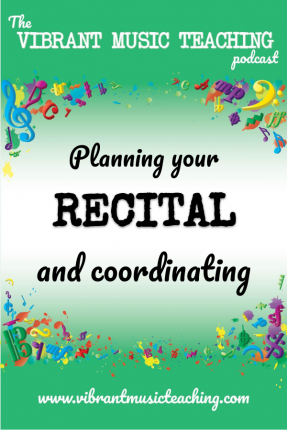 So I’m going to go through step by step a checklist of what you need to do when you’re setting up a concert or recital for your students and things you need to watch out for. At each stage the very first step for me is setting the venue and the date. So looking for a venue can be stressful depending on where you live. It might be even more stressful or less so here. It’s actually very hard to find a venue with a piano. It’s been a struggle every time I’ve tried to set up a concert. Now at this stage I’ve arrived on two school halls one or the other of which are good for my recitals. They’re far from ideal. One of them the piano is not super amazing and the other one it’s quite decent but it doesn’t look the best. It’s a grand piano and it’s well in tune but quite mellow sound you know nice. It’s a big contrast to my own piano but it’s got all these scratches in the side, it doesn’t look great but it is a good venue. And then the other school hall as I said is an upright. It’s not out of tune or anything like that it is well cared for. But it’s not exactly an amazing piano and a weirdly low down I think because it doesn’t have any casters so that can be a bit off putting but at least I have those venues now and when I first looked for venues I seriously struggled. So if you’re living in an area and just pulling your hair out looking for a venue I get it. It is not easy to find somewhere that has a piano and will rent it to strangers as it were people who are not connected to whatever the center or the hall is. So some ideas of where to look. In many parts of the world a church is a really good first place to look especially if you’re part of a church community. Often churches especially in the states as far as I’m aware have pianos. Right. That’s not really a thing here. If we have a piano in a church it’d be a digital piano that was brought in. What’s there is an organ which is not exactly useful but if you have a church nearby which has a piano that will be a great option. Another option is like me you could opt for a school hall. You can get in touch with local schools. Ask them if they have a piano. Only a few do around me and with the ones that do ask them if they’ll rent the hall to you. Many will require you to get insurance public liability insurance and that’s something you really should have anyway so I don’t see it as a problem. It’s not very expensive. I don’t know maybe 200 or so for the year here so it’s not a big cost and it’s totally worth it for the peace of mind. And it is required by schools that I have my own. Public liability insurance. Another place you might look is community centers or retirements or nursing homes or if you want to go outside the box coffee shops or cinemas or any other venue if you want to bring a digital piano. So it depends how pick you are about having an acoustic piano you have a digital piano you can bring with you and you’re happy to do that. You can do it almost anywhere. So the sky’s the limit but just look into different options. Either standard options especially if you’re just getting started just somewhere simple as school hall where the piano or I start to get a little bit wacky and do different things as well. So when it comes to setting the date I often see teachers trying to suit everyone. I would warn you that it’s pretty much impossible. I don’t try to suit everyone. If there is a debate between a couple of different dates I will usually put it to a vote. Like especially if I can’t have the date that I set as the preliminary option on my studio calendar. If that’s not available in schools where we’re holding it then I will write to parents and email around all my studio parents and say that date is unavailable. Which one of these two is best for you or which one of these two can you not make. If you can’t make one of them not just go with the majority. When it comes to my spring recital I always have trouble suiting everyone. I mean it’s impossible to suit everyone because it’s around May and so are Communions and I have a lot of 7 or 8 year old students who will be taking their first communion. So that’s not happening. There’s no way to suit everyone may I just go with the majority. The most suitable date and I suggest you do the same thing so I absolutely put it to a vote. But even in your email about the vote let them know is and I’m going to go with the majority here. So it’s not going to suit everyone but I want a suit as many people as possible and then just set it. Not everyone will be able to come and that’s life. They’ll make the next one. Don’t worry about it. Don’t feel like you have to arrange a make up for a recital or anything like that. Just set it and go forward with that. Make sure to book your venue so once you’ve got your venue and your date set the next step is to think about what your students are going to play right. You want to put in motion a student preparation plan. Now how long in advance you need to set the pieces will depend on what type of pieces your students are going to play. Many teachers will treat a recital as an opportunity to do sort of big project pieces as I would call them that they’re preparing specifically for that recital and they’ll often be quite a challenging level to show off their skills a bit and that’s fine but I go the opposite way. And what we’re choosing for a recital is a favorite piece. If a particular especially a more intermediate advance student wants to pick something out and they’re motivated to prepare something new that’s fine but in general what students are preparing is just one of their favorite pieces. They’re just showing off what they’ve learnt this year and I think that’s a great way to think about it. So since my students are picking something they’ve already done and probably just revising it I don’t need as long a preparation period. I would generally aim for choosing those pieces finalizing the list about six weeks before. At a minimum four weeks before just to make sure we can practice actually performing the piece. But if it’s going to be the piece that they need to learn why you need to take that into consideration you might even need 12 weeks depending on the level of the piece relative to your students level. Once I’ve set when we need to set the pieces normally six weeks before and written that in my diary the next thing to go in is the first trial runs. So about four weeks before I’ll have the students practise performing it for me in the lesson with their bowing with their walk up all of the stuff and playing it to the best of their ability and then schedule a date for a workshop as well a performance workshop where just the students come and they all perform their pieces for each other. So they’re just playing for other students it’s like a sort of stepping stone on the way to performance. And I find it makes a big difference and it’s a really good opportunity for them to play for their peers and get some feedback and practice those performing skills so I always have them watch and try and catch each other out in terms of bowing not in terms of their playing but in terms of bowing smiling all that kind of stuff putting their hands on the keys and thinking before they start all that good stuff. So that happens at the group Workshop and I’ll set about two to three weeks before the actual performance so that they have time to course correct. If they are not prepared for that and if you’re going to have your students memorize their pieces obviously you need to set a date when that’s going to happen by. I do not have my students memorize recital pieces. So that’s not a consideration for me. They can if they want to and some of them are performing rote pieces that I’ve learned from memory anyway. But it’s not a requirement in any sense. So it’s completely up to them whether they play with music or with that. After you’ve put in place put in motion how your students are going to prepare. The next thing to think about are the details of the recital starting with the programs. Now I have templates in the library these days for their vibrant music teaching members so there’s a whole slew of different templates for programs that teachers can log in. Members of VMT can log in and just download and they can fill in their students details so whether using one of mine preparing your own or using a template from somewhere else I suggest you start filling those in as soon as the pieces are set. There is no reason to wait so I’ll normally fill in what my students are going to perform just on a spreadsheet and then I’ll sort out the order there once almost everyone is set I sort out the order of performance. Normally starting with someone who’s going to be confident often that actually means a very young student because they just don’t even think anything of it. So if I know that they’re just going to march up there and play without a problem they’re going to go first and then I’ll often put the most advanced student. Last but I do not build up through the program. I mix it up from there and I try never to put siblings beside each other and never to put two students which are the same age but at different levels or that could easily be compared. Anyway that’s basically how I’m setting up my program order. So I’ll start doing that as soon as we’re setting the pieces or even if I have a good guest at most students pieces I’ll start doing that before we’ve even confirmed them because I really like to get stuff like a program in place as soon as possible. There’s no reason to delay it. So as soon as the pieces are set and everyone’s finalized. Absolutely the program is set to. And it’s set up and ready to go. I don’t print them yet because there may be changes people may drop. Someone may beg me to change their piece or something like that but I do have it set up and ready to go. And then just a couple of days before maybe three days before just in case there’s any emergencies I’ll print out those recital programs and I print them mad at home just simply print them out on two sides. The type of program I do are always the kind that you fold OK they’re like a greeting card kind of shape. So I print them out double sided and then just fold them in half. That’s all I need to do increase them and they’re ready to go. I print out normally three times the number of students although I think we can reduce that to only two times. I’m always nervous of running out but I literally I’m always left with extras. So if you’re debating it and you’re not sure I think three times a number of student is plenty. Often families will share often young students will not have their own and even siblings will not have their own because the parents know they’re just going to drop it on the floor or make noise with it or something. So three times the number of students is ample even to is probably enough depending on the number you have attending of course. So the programs are set your students are set to prepare their pieces and you’ve got your venue and your date and everything is booked. The last things we need to think about are first of all the posters tickets and attendance type things. So by this I mean if you’re going to have posters to advertise the recital or if parents are going to purchase tickets you need to make that clear with parents so you need to send around an e-mail that lets them know how many people can attend whether they need to purchase tickets and all that good stuff. In my studio at the big end of year may recital is not actually the end of our year but the spring recital I allow people to bring as many guests as they want. For most this’ll only be like two or three but they can have all the guests that they want to because I have a school hall. I can’t possibly fill it. It is literally impossible for us to fill it. So we’re going to be at the front half of it anyway. And the more the merrier as far as I’m concerned. In the January recital I hold those in my home studio in smaller groups. Those are only for parents of students and if they ask me especially their siblings as well or something like that but they really need to let me know when they have extras who need to come. Often this works out fine because actually if I have siblings that I teach all the siblings then there’s only two parents for three students. So it all evens out but I do make it very clear that I don’t have space for extras and you need to let me know if you need extra seats at the Spring recital. Yeah I encourage them to let me know about the numbers just so I can prepare the chairs correctly and it doesn’t look empty or I don’t have to go running for chairs at the last minute. But really they can have as many seats as they want to. Just make sure to let your parents know what to expect how to let you know about attendance rates and that kind of stuff. And if you are going to sell tickets let them know how to purchase them. The last thing to think about then is the refreshments and the decorations both of which are optional. As I said at the beginning if you’re a new teacher keep it simple really need decorations you don’t really have to have refreshments if you want to do them great at the spring recital in my studio. I do not do refreshments cause as I said many times there it’s in a school hall, I don’t really have the facilities to provide refreshments there. It doesn’t really make sense so we just do the recital and it’s a longer one than the January one so it works out great. We don’t do refreshments. I do decorate so last year I did balloons which was really good fun and then I gave one to each student to take home maybe their parents cursed me a little bit but hey it was good to give them a little a little gift on their way home as well. The year before that I did a huge tissue paper flowers. Anything that’s going to make a big impact on that school hall just make it a bit brighter or more colourful if you’re going to do refreshments. One option is to have parents bring one each. I feel like that makes it into a bigger to do and a lot of cases and that’s great if that’s what you want if you want people to hang around for a long time. If you don’t if you just want them to stop for 15 minutes or so after to just chat a better debate then I’d suggest just juice and biscuits. That’s totally fine. I simply for the January 1 I’ll buy some biscuits or other small treats biscuits are the easiest. Lay them out on a platter and then buy some various juices. That’s it. They will just help themselves and it gives them a chance to you know revel in the glory of their performance a little bit and chat and catch up but that’s it. It’s not a big deal and it cost me maybe a tenner or something like that. Okay so that’s my recital checklist. I’ll run through it very quickly. First step is to sort out your venue and your date and set that in stone as it were then you need to think about your student’s preparation setting the pieces and how they’re going to get ready in time and all the check points along the way you need to think about a performance workshop if you’re going to organize one and set the date for that. Then you need to set up your programs for your recital and put in all the students and the order that go into performing well in advance so they’re ready to just hit print close to the time. Then you need to think about the attendance and letting the parents know about tickets or how you’re sorting out the numbers of seats they’re allocated. And lastly you’ve got the extras the refreshments and the decorations and that’s it sounds simple. I know it’s a lot of work but it is totally worth it when you see smiles on students faces. So I hope your preparation for your next recital goes fantastic. Next week we’re going to look at how to take things up a notch and make it more exciting and add some sparkles and some themes and some fun stuff like that. So until next week I’ll chat you then. If you’re a vibrant music teaching member you can access the replay of the webinar. I did all about making recitals exciting and also of course those recital program and poster template in the library. If you’re not a member you can sign up today at VMT.ninja and get instant access to all of that stuff and so much more.